Essex Bay Sailing Club. The sailors develop the right confidence by sailing in the Essex River. The Essex Bay Sailing Club races in several zones throughout the year depending on weather conditions. Most of the racing areas are protected offering the teams a unique experience navigating the tides of the river and different onshore and offshore wind directions. The Essex Bay is extremely beautiful and ever changing. Zones 1, 2, & 4 are located outside of the channel and give sailors a safe course to race outside of boat traffic. A few instructors are always following the sail boats in fast boats to help with any sailboats that go off course or need a tow back to the dock. Safety is always the primary goal. The instructors are always sensitive to the sailors needs and never push to make someone participate when they are uncomfortable with a situation. Though a sailboat can sail a straight line away from the wind or to leeward, it cannot go directly upwind (windward, or to weather). Therefore, it zigzags, or tacks (opposite), as close as possible to the direction from which the wind is blowing, changing direction each time so that the windward side becomes the leeward side. 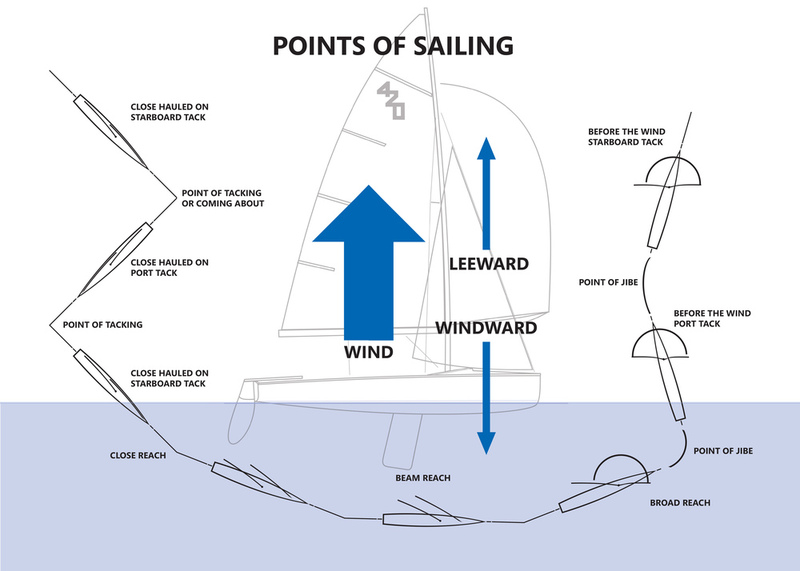 When moving in this manner, the boat is beating, close-hauled, or on the wind; and when the wind is coming over the right (starboard) side, the boat is on the starboard tack. When the wind is coming from the left (port) side, the boat is on the port tack. A boat in the act of tacking to windward is coming about or going about. A boat in the act of tacking downwind is jibing. A boat can be on port or starboard tack whether it is beating, sailing a little farther away from the wind on a close reach, straight across the wind on a beam reach, still farther away from the wind on a broad reach or in the same direction as the wind, before the wind. Draft (min.) 0.30' / 0.09m Displacement: 195 lbs./ 88 kgs.